Myolie won the group of newcomers, receiving \"Recommended Newcomer Award\".When she was singing \"Solo Travelling\", rumoured boyfriend, Bosco Wong, sat at his seat, supporting sweetly, clapping and singing along. 3) At last night\'s JSG Awards, besides a fierce battle between the kings and queens, newcomer awards were also having a strong competition. Being TVB own children, Bosco Wong, Linda Chung and Myolie Wu won quite a few newcomer awards. 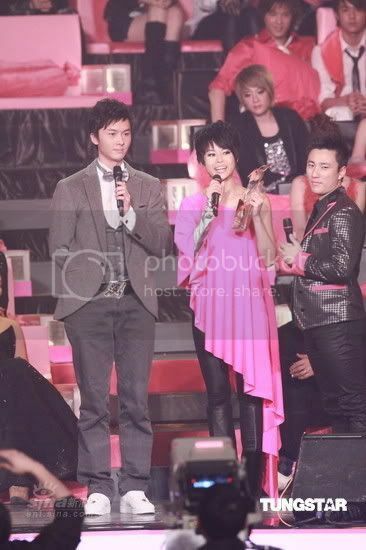 And William won gold for Most popular Male Newcomer, and G.E.M won gold for the similar award. William\'s song make the whole event really high. All the newcomers wore shocking pink last night. TVB artistes, Myolie Wu, Linda Chung and Bosco Wong 均 有 斬 獲 (anyone can help with this? hee..thanks). 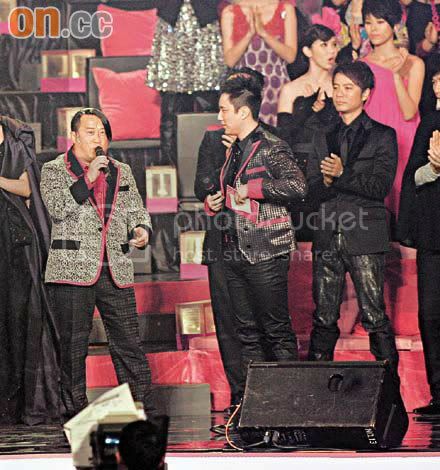 Among the group of male newcomer, William won TVB own sons Bosco Wong and Wong Cho Lam in the gold award. Bosco and Tat Dik each won Silver and Bronze respectively. As for female newcomers, 17 year old GEM successfully won Gold, Linda and Fiona won silver and bronze respectively. Myolie won Most Recommended/outstanding award. When she realised that she has to sing a song after receiving the reward, she said in shock: Have to sing ah? When she was singing, rumoured boyfriend, Bosco clapped along and sang. Myolie and Vincent won bronze for Most popular duet award, with their song, Most difficult Day. In addition, the organizers arranged an experienced singer to duet with a newcomer. Eason and Bosco sang \" King of K Songs\", Myolie also sang with Bosco. Eric Tsang teased that Bosco ever sang out of tune for this song, and when Bosco was singing, he needed to rely on Eason to sing. In the end, lucky that he passed the stage. Only mentioned that Myolie is open to take pictures with Bosco thats all. Thanks for posting this up. My Chinese is not good but the translation for Myolie award has to do with progress/ vastly/much improved? I don't know the most appropriate translation for her award neither. haha.. yeah..i don't know what to name her award either.. anyone? Which duet won the bronze ? Most Difficult Day or At That Time, At this Moment ? ^Most difficult Days won the award I love the song! bosco was so sweet to clap for myolie and sing along with her!!!! Boscolie wore pink!! Matching pairs! 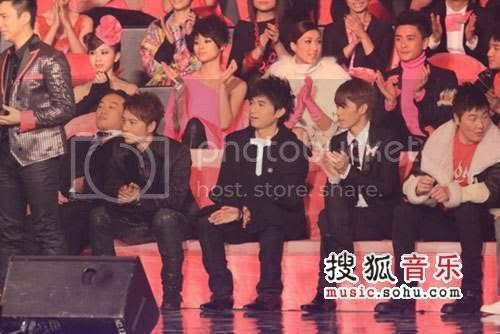 The third of Hong Kong's four main music awards ceremony was held on January 3rd, TVB's Jade Solid Gold (JSG) Award Ceremony. Miriam breaks Joey's string of 5 straight wins at Most Popular Female Singer. This leaves Anita Mui's record intact. Wow, after watching all those clips, Myolie has a lot of supporters from the audience. 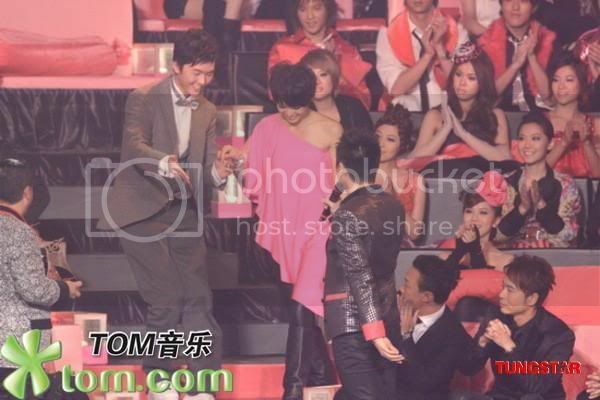 I can hear them screaming her name 'Wu Hang Yee' and cheering for her when she received her 2 awards. Thank you HK fans and we overseas fans wish we could join in as well. ai i wish she would at least won bronze for most popular newcomer. oh well. i am still happy for myo!